Do any of you guys watch the show ‘Cupcake Wars’ on Food Network? It gets a pretty bad rap, but I still enjoy it. Apparently there are a good amount of other people that do too, because it’s been on for a few years now. I like to see the creative ideas that the competitors come up with for crazy ingredients, then I like seeing them create 3 of their own signature cupcakes with the different fillings and flavors and frostings. Of course it’s not a perfect show: for one, the host really gets on my nerves with his lame jokes at the different time markers throughout the competition. I feel like if one of the other Food Network personalities were hosting it, the show would be stronger. Just my opinion. This may be just me and my suspicious nature, but I’m not so sure that I buy the whole “1,000 Cupcake display” that they claim to make the competitors put together at the end for a special event. Maybe it’s a few hundred cupcakes, but from what I’ve seen in most of the episodes, it really just doesn’t look like that many. Before I watched the show I didn’t know that there were such things as ‘cupcakeries’ that specialize in putting out gourmet style cupcakes. I blame it on my hometown. It’s lame when it comes to Foodie Culture. But even if we did have a cupcake bakery that sold $8.00 cupcakes, I’m not so sure that I would be bum-rushing the doors to get some every week. #1, when it comes to desserts, I don’t usually have extreme cravings for regular cake- pound cake is ALWAYS welcome, but my cravings for typical, moist cake are far in between. #2, I’m a simple girl when it comes to my favored cake flavors. My favorite type of cakes are a golden yellow cake with milk chocolate frosting, and a french vanilla cake with white frosting- both of which I think would be a waste of money to buy at a cupcake bakery. If I buy something from there, I’ll probably try to get a wacky, loaded flavor like a caramel apple pie cupcake, or a banana pudding style one, or something like that. If I want a normal, ‘plain’ cupcake, chances are I’m just going to make it myself. This may sound weird, but I actually really love it when people I know specifically ask me to make them something that they’re craving to eat. It makes me feel kinda special that they’re letting me feed the craving of something that they love. Good food makes us happy. When I serve someone good food, I get to be apart of making somebody happy- and even if the happiness is temporary, that’s not something I think should be taken for granted. We could all use a little bit more of making somebody else happy especially when so many of us struggle (and fail) to make ourselves happy. Focusing on other people’s happiness is a lot less trouble than focusing on our own, am I right? Of course right. One of my friends recently had a birthday and she wanted some vanilla cupcakes to celebrate it, so I was happy to make these for her. I’m really happy with how these turned out. The cake itself is moist, soft and golden. This was also my first time making real buttercream frosting, and I think it was a huge success. It’s not like that lardy, crap that they make in store bought cupcakes that makes you want to barf and that you just end up scraping off- no, I’m pretty sure that this is the kind of frosting that you may even like more than the cupcake itself. Yep, it’s that good. And the nonpareils? Well they’re there because I think they look pretty and cute- just like the whole idea of cupcakes themselves. These little babies are my contribution to this week’s Fiesta Friday, hosted by Fae@Fae’s Twist and Tango and Suzanne@apuginthekitchen. Every week I get so pumped about bringing my dish to this awesome link up, as well as getting the chance to see what everyone else has been up to in the kitchen to bring. Have a good weekend guys! 1. Preheat oven to 350°. Place 12 paper liners in a muffin pan. 2. Put the butter and granulated sugar in a bowl and beat together until pale and creamy. Gradually beat in the eggs and vanilla extract. Sift in the flour and baking powder, then fold in gently. 3. Divide the batter evenly among the paper liners and bake in the preheated oven for 15-20 minutes, or until risen and firm to the touch. Transfer to a wire rack and let cool. 4. To make the frosting, put the butter into a bowl and beat with an electric mixer for 2-3 minutes, or until pale and creamy. Beat in the cream and vanilla extract. Gradually beat in the confectioners sugar and continue beating until the buttercream is light and fluffy. 5. Use a small spatula to swirl the frosting over the tops of the cupcakes. Decorate with sprinkles. 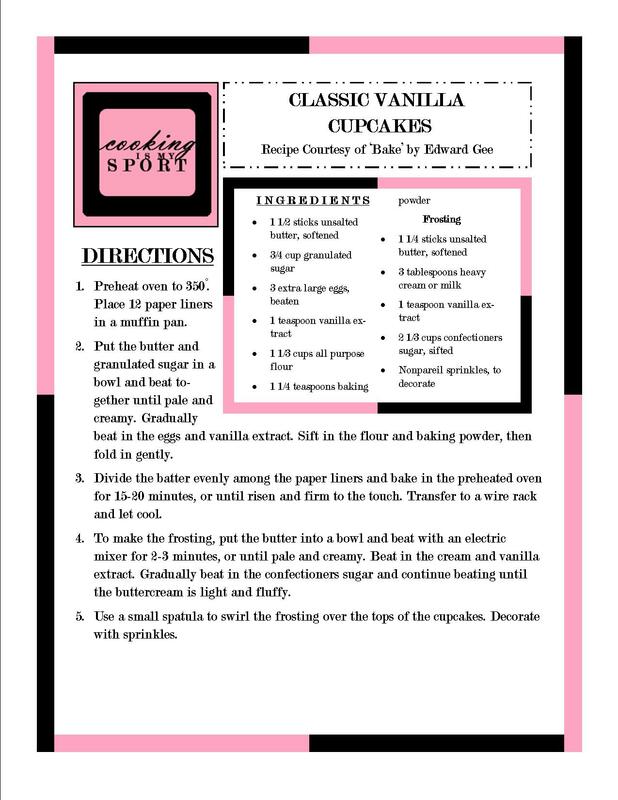 Sometimes, nothing but a vanilla cupcake will do, and this recipe sounds delicious. The cake part looks perfect…far from dry. And bravo to you for conquering homemade buttercream! I bet these little beauties put a huge smile on your birthday friend’s face. They did get pretty good reviews (thankfully), thanks Nancy! I have seen cupcake wars, it’s an interesting show and anything involving cupcakes is good in my books. I love your vanilla cupcakes, absolutely classic and delicious and everything is good with sprinkles. 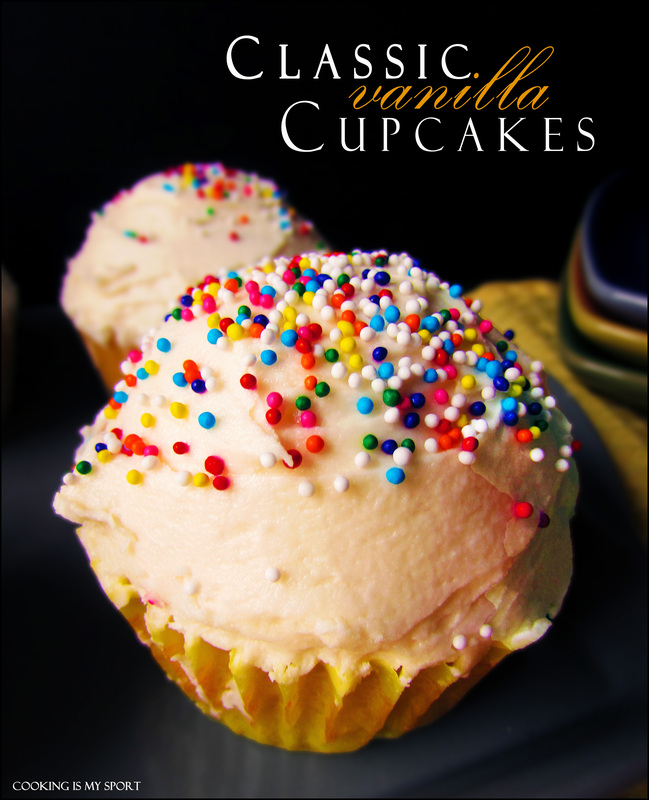 I love vanilla cupcakes! Yours look like they would melt in your mouth. And everything is better with sprinkles! I like watching Cupcake Wars, too. It is really fun to see what kinds of yummy cupcakes they come up with, kinds I would never think of in a million years. Thanks for sharing your delicious recipe with us! Your friend is very lucky. Jess- these look lovely! Never heard of that show before. I love buttercream as you made it without the lard. Like you said it doesn’t have that greasy aftertaste. The cupcakes look yummy! Thanks Jayeeta, I appreciate it! Classics are always wonderful. My husband’s favorite is yellow cake with chocolate frosting. Even our small city has several cupcake cafés, but they don’t do it for me. I am extremely picky and would rather make it myself. Besides I am all about the cake, not the frosting. They cupcake cafés all use way too much frosting for my taste! These look perfect! Vanilla cakes always hit the spot! I agree! When I get a craving for cake, vanilla cake is all that will do- thanks Anjana! 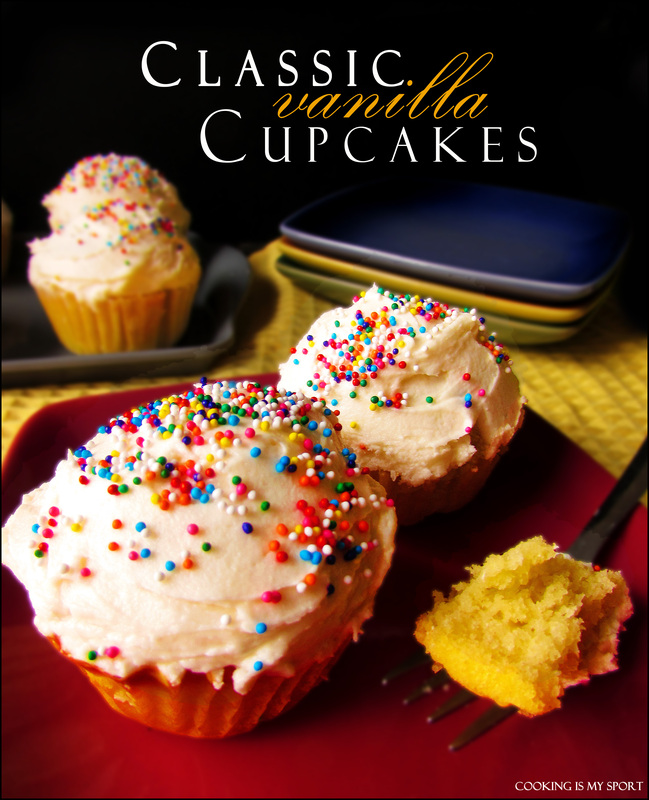 I love the sprinkles on your classic cupcakes! They are so happy! I LOVE that description; sprinkles DO make food just happier lol Thank you! I really like your blog. The recipes are always good and you said “crap” and “barf” in your post. Awesome. Haha thank you Cristina. I write how I talk, so words like that end up coming out a lot. Posted	 June 14, 2014 at 9:37 pm by Ngan R.
I much prefer vanilla cupcakes to the fancy “gourmet” ones that boast exotic flavors. 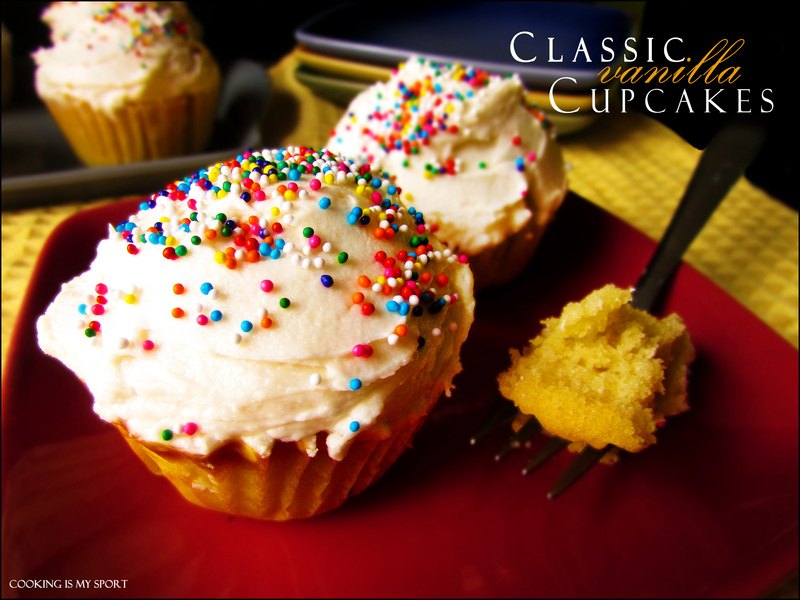 Vanilla cupcakes are so comforting and always remind me of my childhood. Great job, Jess, and I am sure your friend loved these! I think there’s such a thing as ‘too good’- just as long as I get to eat it 😉 Thanks Kloe! 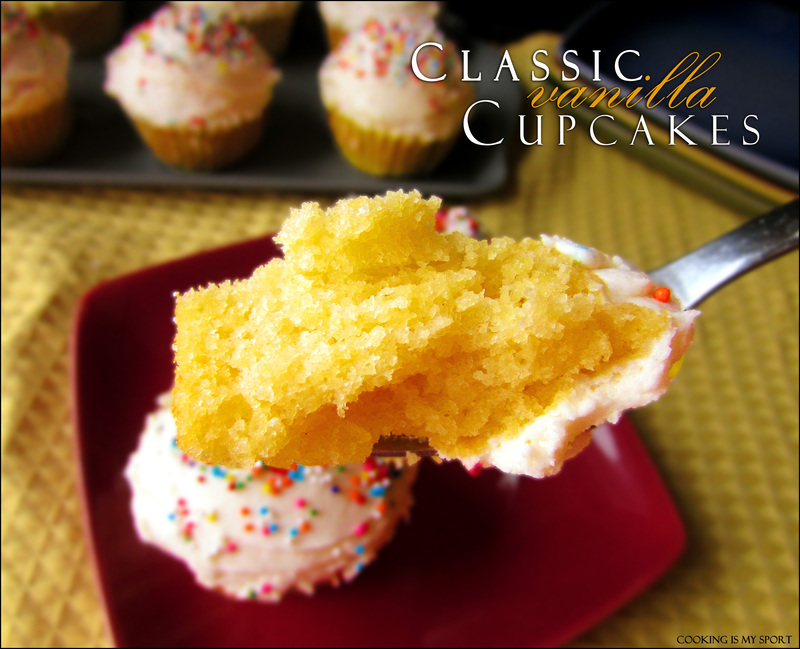 Yum, you can’t beat a good ol’ classic vanilla cupcake! I’ve never seen cupcake wars, I’ve heard a lot about it though. Simplicity is often best 🙂 Anytime we make what some would consider just a “simple” meal it always seems to be so much better than the fanciest thing we’ve ever made. WHO could ever pass up a vanilla cupcake? Not me, that’s for sure. Of course I’m not likely to turn down a vanilla anything, but that’s just me lol Thank you!